The shop will be closed for some of the holidays, as notified. From King Shaka International airport, take the N2 south towards Durban. At the interchange 165/EB Cloete, keep left and follow signs for the N3 towards Pietermaritzburg/Johannesburg. Turn left onto N3. After 6.1km, take exit 17 to merge onto M13 / King Cetshwayo Highway towards Pinetown/Pietermaritzburg. After 13.8km, take exit 28 for the R103/Old Main Road towards Hillcrest/Gillitts. Go 220m and turn right into Old Main Road. Travel through Hillcrest and proceed up Botha’s Hill. After approximately 6km, you will reach the summit of Botha’s Hill and will pass the Lifestyle Value Centre and Botha/Chapel Roads on your left. After another 500m you will come to the main gates of Kearsney College on the left. 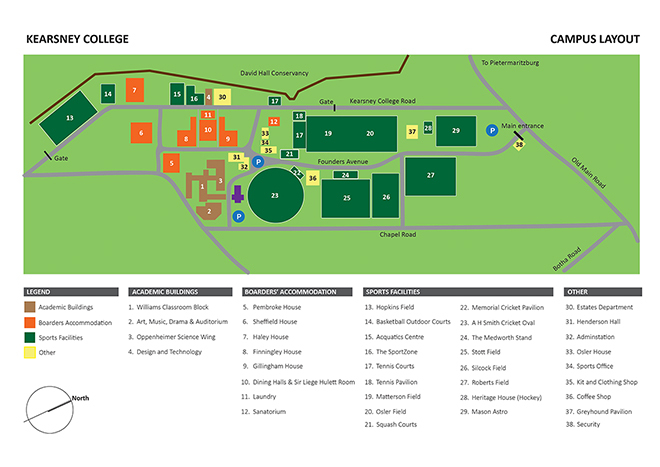 Please ask for any further directions required at the security gate just inside the College grounds. Travel south along the N3. Take exit35 onto the M13 towards Hillcrest/Durban. After 1.6km, take exit 33 towards the R103/Assagay/Hillcrest West. After 450m, turn left into Kassier Road. After 3.3km, you will reach the traffic lights at the intersection with the R103/Old Main Road. Turn left into Old Main Road and proceed up Botha’s Hill. After approximately 2km, you will reach the summit of Botha’s Hill and will pass the Lifestyle Value Centre and Botha/Chapel Roads on your left. After another 500m you will come to the main gates of Kearsney College on the left.